Historians generally agree that the first true "explosive" was black powder, which was developed around the 13th century. The first recorded use of black powder for demolition purposes appears to have occurred in the early 1600s, when quarries in Hungary began using it for rock blasting. Shortly thereafter, black powder was put to use in the tin mines of England, and Switzerland adopted blasting technology for road construction. One of the first documented attempts to actually fell a building with explosives occurred in 1605, when disgruntled Englishman Guy Fawkes placed barrels of explosive powder under the British Parliament in an attempt to blow-up the structure and kill King James I. Although Mr. Fawkes was apprehended before he could detonate his explosives, the event drew considerable attention, and 400 years later, it is still commonly referred to throughout the United Kingdom as "The Infamous Gunpowder Plot." 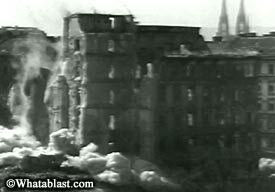 Another benchmark in the history of explosive demolition occurred in 1773, when demolitionists used 150 pounds of gunpowder to raze the 700-year-old Holy Trinity Cathedral in Waterford, Ireland. According to a report in The Irish Times, the structure "succumbed to a deafening boom, and was instantly reduced to rubble." This appears to have been one of the first documented attempts at a controlled "building implosion," although modern demolition experts point out that the use of such a low-velocity explosive probably caused more of a building ex-plosion. The use of explosives to demolish structures in America began in the early 1850s, when San Francisco was repeatedly decimated by a series of great fires. In a desperate attempt to limit damage from these events, city council members approved the use of explosives to demolish various buildings in a fire's path in the hopes of cutting off its fuel supply. A city ordinance ordered the appointment of a Chief Fire Engineer, whose official responsibilities included, "the blowing up of any building or buildings with gunpowder which he may deem necessary for the suppression of fire." Not surprisingly, this radical abatement method often met with vocal opposition from many of the residents and merchants who lost their homes and businesses. However from that point on, San Francisco fire departments purchased and stored gunpowder as a standard firefighting tool, and the city would continue to figure prominently in explosive demolition experimentation for years to come. While America's rock blasting and fire-fighting industries were just beginning to capitalize on the advantages of blasting powder, an Italian chemist named Ascanio Sobrero was completing work on his powerful new explosive mixture, nitroglycerine. By the late 1850s, nitroglycerin had established a reputation as an extremely efficient - but volatile - explosive. However several scientists, including Swedish chemist Alfred Nobel, began experimenting with ways to stabilize nitroglycerin by combining it with various amounts of diatomaceous earth (also known as kieselguhr). Nobel eventually developed a safer, more shock-resistant form of explosive that he named dynamite. In America, some of dynamite's first uses were to create trenches for irrigation systems, to blast rock in mines and quarries, and to remove trees and stumps. This in turn led to larger and more ambitious roadway projects, which helped "pave the way" for the industrial revolution. * In 1883, an engineer in Budapest, Hungary used five small blasts to fell a 200-foot-tall, octagon-shaped masonry chimney in one of the first recorded uses of dynamite to demolish a structure. * In 1889, dynamite was used to break apart an 11-million-square foot solid mass of debris that became wedged against a Pennsylvania Railroad bridge as a result of the Great Johnstown Flood. * In 1900, South African saboteurs packed two locomotives with dynamite and started them towards each other from opposite ends of a railway tunnel in an attempt to destroy the tunnel. Although resulting explosion demolished the engines, the structure itself suffered little damage as most of the energy merely dissipated back through the open entrances. By the turn of the century, the first "skyscrapers" were being built in major cities across America, which meant that demolitionists would eventually be called upon to remove ever-taller structures. On April 18, 1906, San Francisco was struck by the most famous and devastating of its many earthquakes. The quake killed hundreds of people, initiated more than 50 fires, and broke hundreds of water pipes throughout the city. This left dynamiting as the only way to check the fire's advance. Within hours, the Mayor of San Francisco dispatched telegrams to surrounding communities stating simply, "Send fire engines and dynamite, immediately." For four days and nights, hundreds of firefighters, miners and military troops worked furiously to blast entire city blocks in an attempt to choke off the inferno. By the time the last fire was extinguished, thousands of buildings had burned to the ground and hundreds more had been leveled with dynamite. But the blasting efforts were at least partially successful and were credited with saving large western sections of the city. In the weeks that followed, many blasters were called upon yet again, this time to explosively demolish dozens of unstable, burned-out structures throughout the region. Aside from being utilized as a desperate fire-abatement method, there gradually evolved two other primary reasons to consider the use of explosives to bring down structures: Worker safety and preventing harm to adjacent liabilities. Quite often, demolition experts found these two factors dovetailing. To address both issues, engineers began devising ways to bring walls down within their own perimeter through the use of explosives. This was usually accomplished by one of two methods; either by blasting one wall at a time, or by carefully pre-weakening several of the walls and columns in tandem and simultaneously blasting them inward. The fire had weakened the structure to such an extent that it was a menace to both life and property, and to the business of adjacent stores and shops. In exactly eleven days the building was completely removed." Although at the time no descriptive name existed for felling structures in such a controlled, inward fashion, these projects were later credited by many industry veterans as the first true "building implosions" performed in the United States. More important, however, these early efforts were the first to demonstrate the advantages of applying explosive technology to emergency response operations. Over the past century, explosives have been used to fell structures rendered unstable by a myriad of external forces such as fire, earthquakes, tornadoes, sinkholes, collisions, terrorist acts and inferior construction. During the century's first few decades - and with experimental shaped explosives still in their infancy - conventional dynamite was becoming a valuable tool for the destruction of large industrial structures such as smokestacks, railroad bridges and mine headframes. Dozens of these items were blasted during this era, and powder manufacturers gradually began encouraging their clients to consider economics in decisions relating to explosive demolition. An article written by C.B. Spicer of the Hercules Powder Company profiled the demolition of four heavily reinforced grain silos in St. Louis, Missouri, and told of the savings the property owner realized by choosing explosives over contracting for scaffolding and manual demolition. "The project attracted considerable attention as an engineering feat, (and) much favorable comment was expressed on the use of explosives as the controlling factor. (Another) advantage to dropping the silos by this method was that the impact with the ground demolished the stacks so completely that the debris could be conveniently handled by a steam-shovel." This was one of the first documented instances wherein the use of explosives as a catalyst for exploiting the earth's natural gravitational-pull to facilitate "debris breakage" was recognized as an economic asset, and this benefit remains a significant factor in many blasting-versus-conventional-demolition decisions made today. Although the industry was experiencing many successes during this era, explosive demolition could hardly be considered an exact science. While most projects went well, several of the more stubborn structures - particularly concrete silos and wide-based smokestacks - took three or four blasts to bring down. In fact, a few of these structures were never successfully blasted, and eventually required the use of heavy equipment to tip them over. Still, few people seemed particularly upset, as most projects performed during this era were viewed more as curious oddities than anything else. 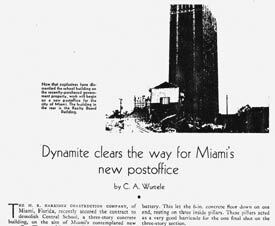 In 1931, the Florida Dynamite Company was hired to raze the Central Schoolhouse in downtown Miami. This job differed from most blasting projects, however, in that the building showed no signs of fire or structural damage. In fact, there was nothing physically wrong with it. The general contractor had merely decided - correctly as it turned out - that spending $60.37 for dynamite, caps and wire would be the most efficient way to bring the building down. Throughout the 1930s, structural explosive demolition was overseen by engineers working directly for large dynamite manufacturers. 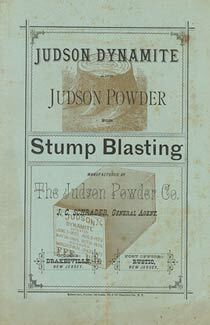 Their goal was not necessarily to implode buildings, but to find new and innovative ways to sell more blasting products. They soon realized that in order to use dynamite near populated areas with consistency, they would have to limit the effects of flying debris. So they began experimenting with various types of "protective measures." "The stone bridge to be blasted was near occupied houses, so the holes were covered with bundles of willow branches, and throughout the blasting operations, nearby buildings suffered no injury, nor were there any accidents." By the end of the decade, structural explosive demolition was becoming less of an oddity and more of a specialized service offering a predictable, successful result. During the first half of the 20th century, most advances in explosives development came as a result of the two world wars. The favorable combination of unlimited funding and an "urgent need" allowed researchers to create ever more efficient and powerful explosives. Unfortunately, most of these developments were used to bring harm to people and property. But there were exceptions. For example, at the end of World War II, demolition experts began using dynamite and recently invented plastique explosives to safely bring down thousands of war-torn buildings throughout Europe. Great Britain went so far as to create a "Special Commissioner of Clearance" who coordinated the efforts of 13,000 troops from the Royal Engineers that were trained in the use of explosives. Initially these structures were blasted with little concern for surrounding properties, not unlike the San Francisco undertakings performed 40 years earlier. Using minimal protection and no "delay devices," the powerful blasts generated large amounts of flying debris as well as significant ground vibration and airblast levels. Faced with this problem, the demolition teams eventually discovered that by staggering several smaller blasts - borrowing from a basic technique that had been used in rock-blasting for years - they could maintain more control over the direction of a building's fall while simultaneously minimizing the amount of ground vibration and airblast. 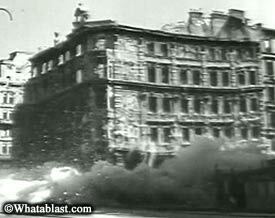 With literally hundreds of structures on which to practice these new methods, explosive demolition made great strides. By the late 1940s, documentaries and newsreels were showing a fascinated world how European military experts had become proficient at bringing down large structures in dense urban areas without harming adjacent properties. Structural explosive demolition had finally come of age on all major fronts, having been proven as a consistently dependable, economically viable, and above all, safe alternative to conventional demolition methods. And one thing was certain; it would just be a matter of time before private blasting entrepreneurs could develop a way to capitalize on this revolutionary method of removing society's "unwanted" structures.